Located adjacent to downtown Atlanta, Sweet Auburn District is full of history. Most famously known as the birthplace of Dr. Martin Luther King Jr., this neighborhood was designated a national historic landmark in 1976 and is easily accessible to Downtown by way of Atlanta Streetcar. Morning: Grab breakfast at Sweet Auburn Bread Company, where former President Bill Clinton stopped for its well-known sweet potato cheesecake. Head east after breakfast and visit the mural honoring well-known civil rights activist John Lewis, located on the corner of Auburn Avenue and Jesse Hill Jr. Drive. 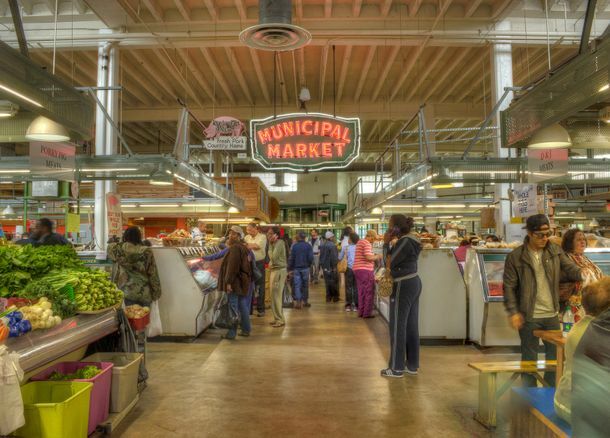 Afternoon: Head to Sweet Auburn Curb Market for lunch. The Curb Market is located inside the original Municipal Market building which opened in 1924 and was Atlanta’s first official farmer’s market. The Curb Market houses 24 stalls including Grindhouse Killer Burgers and Bell Street Burritos. After, go a block west to visit APEX Museum. Founded in 1978, APEX Museum (which stands for African-American Panoramic Experience) presents the nation’s history through the eyes of African-Americans. The museum also has a replica of the first Atlanta streetcar. Refuel: If you’re in need of a mid-afternoon pick-me-up, stop in Condesa Coffee. This independent coffee shop is located in the historic Atlanta Daily World building, which was the oldest continuously operating, daily African-American newspaper from 1928 to 2008. Order the cortado, a double espresso with steamed milk, to fuel the rest of your afternoon. Evening: Enjoy dinner at Sweet Auburn Seafood, located off of Auburn Avenue, and order the Sweet Auburn crab cake with a side of jalapeno cream corn to top off a day of exploring. After dinner, go out for a night of dancing at Soul Bar at Pal’s Lounge, which is open seven nights a week and features local Atlanta DJs. Visit www.atlanta.net/explore/neighborhoods/eastside/sweet-auburn to learn more about Sweet Auburn.